We’ll only know if he’s in the T20 team to take on Bangladesh in Napier on Tuesday night after the coin toss, but Tom Bruce has had his hopes up since he was named on the 14-man Black Caps squad in December. If he gets a chance to shine in the first Twenty20 match of the Bangladesh tour at McLean Park, and the second and third in Mount Maunganui’s Bay Oval on Friday and Sunday, he has a good chance of being selected for the Black Caps Test side. Bruce has been on selectors’ radar since at least January 30 last year, when the then-24-year-old smashed 71 off 23 balls for Central Districts Stags in the Ford Trophy final. His knock helped the Stags to an unconquerable score of 405 for six against Canterbury Kings, and they took the trophy for the second year running. Batting T20 is all about smashing sixes, and this is also an area Bruce does not fall short in. He smacked 17 sixes last season, a total second only to the 17 hit by Hamish Rutherford and Mahela Jayawardene. If his bat is included in the line-up on Tuesday night, he has the power and skills to make quite a difference. 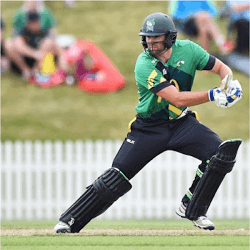 It isn’t only the consistent power hitting that has taken him to sixth place on the strike rate charts in the McDonald’s Super Smash, that won the Te Kuiti-born slogger his place in T20 squad for this section of the ANZ International vs. Bangladesh Tour. Selector Gavin Larsen also commended him for his gamesmanship, which he reckons Bruce has taken to another level this season. With rapidly evolving craftsmanship to back up a swing that seems equally in command, whether he’s smashing the white ball through leg or off, the 25-year-old is all set to impress in the T20s. If he makes an excellent showing, it would be a strong motivation for the Black Caps to test him in the five-day version of the game.